Most people who live and work in the Calder Valley will now have heard of Slow The Flow Calderdale and the work we are doing to reduce the likelihood of flooding, especially if your house or business is at risk of being flooded. Indeed, our reach and influence now permeates throughout the UK – we have connections with communities, academics and organisations involved in Natural Flood Management (NFM). Natural Flood Management will not prevent or reduce flooding on its own, but neither do we wish to rely solely on hard engineered schemes, which tend to push the problem downstream rather than addressing the cause. 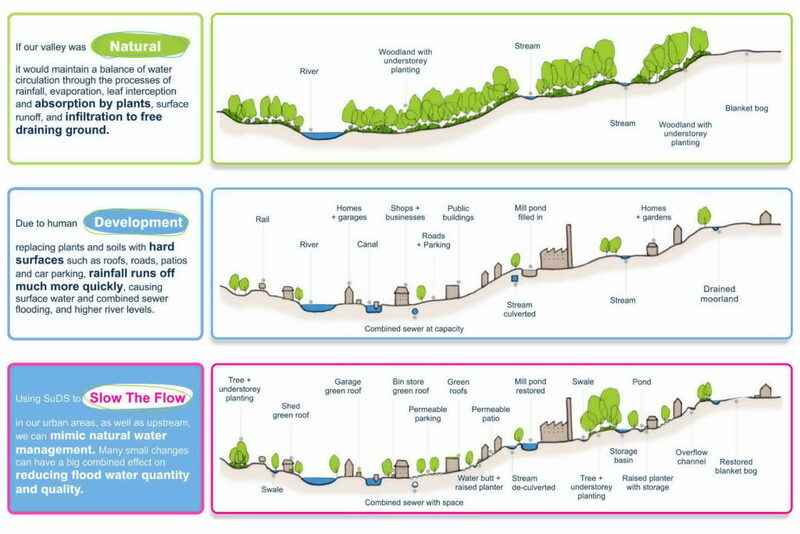 There has to be a holistic approach to flood management using every method available from natural processes to the traditional engineered schemes we have seen throughout the UK. NFM can be a cost effective way of reducing flood risk, and often provides additional Green Infrastructure benefits such as biodiversity, air quality, aesthetic value, and mental health. It is projects like ours which are helping to build an evidence base to demonstrate that natural methods can work effectively to reduce flood risk. Communities who are at risk of flooding cannot rely on central government and their agencies to tackle this ever increasing and expensive issue and as such we must all play our own small part. Our projects demonstrate how small interventions can be adopted on a local level by householders and landowners and not just by local authorities and government agencies. Since 2016, Slow The Flow Calderdale has been developing various projects to contribute to the reduction of flood risk in the Calder Valley. The lessons we are learning will benefit us all around the UK and beyond. Here is an overview of them all. This was our first project and came about as a result of the river surveys we conducted throughout the Calder Valley in 2016. These surveys, using our growing number of extremely dedicated volunteers, enabled us to identify areas which could be used to slow the flow of rain water as it made its way off the hillsides into the river network. We walked miles of our rivers detailing the features of Hebden Water, Crimsworth Dean, and others from Todmorden through to Mytholmroyd. These surveys were physically enduring at times but it gave us an intimate understanding of the river network which the agencies responsible for flood prevention had never had previously. The river surveys gave us the knowledge and insight to prepare a report on the land at Hardcastle Crags owned by The National Trust who. 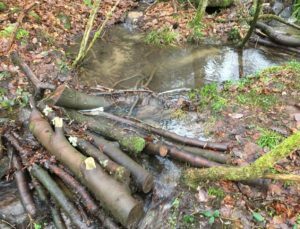 The report was accepted by the Environment Agency who subsequently funded the work we now carry out building NFM interventions such as leaky woody dams in Hardcastle Crags. 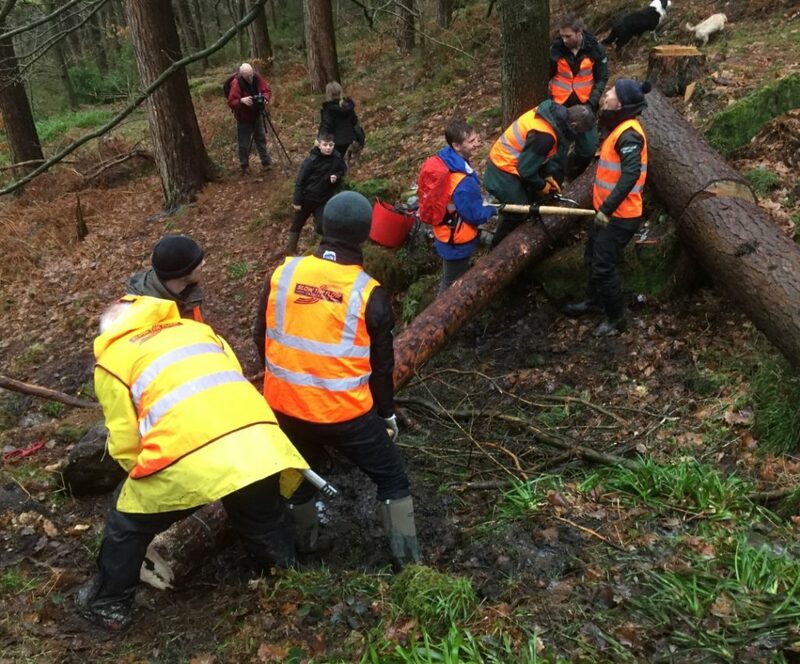 To date, we have built over 160 leaky woody Dams in Hardcastle Crags using our teams of dedicated volunteers and working with The National Trust as part of their forestry plan. The project also involves thinning of the woodland as part of the longer term woodland management plan. This will encourage a stronger and healthier understorey of plants and young trees which increases the roughness and slows the flow and also reduces sediment erosion. We have also welcomed corporate groups from the Environment Agency and Calderdale Council and others as well as our regular and growing number of volunteers who work with us twice a month. Throughout the Summer, we will also be working with Hebden Bridge Cubs to help them with their badges as they help us build even more leaky woody dams. Additionally more corporate groups are planned throughout the year. If your company would like to get involved, please email secretary@slowtheflow.net with your details. For more info on this project at Hardcastle Crags, click here for more info. Slow The Flow along with The Source Partnership and South Pennine Facilitation Fund, Calderdale Council and The Environment Agency have recently launched the NFM Grant Fund. Calderdale farmers and landowners now have a new opportunity to help deliver natural flood management and contribute to flood mitigation and alleviation. As part of the Calderdale flood action plan currently being delivered, Calderdale Council has been working with the Environment Agency and The Source Partnership with support from the Woodland Trust on this new grant scheme. Initially £200,000 is being released by the Environment Agency and Calderdale Council to support delivery of NFM interventions. Slow The Flow was instrumental in putting this new scheme together and we continue to work on its implementation with our partners agencies. The scheme launched on Wednesday 9 May and initial applications need to be with Calderdale Council by Wednesday 20 June. Grants will pay for the cost of the measures installed and cover some of the future maintenance costs. Along the Calder Valley, there are currently only 8 river level monitoring stations from Todmorden to Sowerby Bridge. More info here on the current monitors in Calderdale. Along with our partners The Flood Network and The Environment Agency, we are installing more river level monitors and engaging with local residents to develop this network of river level monitors. To date we have six monitors at Hebden Water and Crimsworth Dean Beck which measure the river levels and use LoRaWan technology to relay these results back to a central hub for communities to see how our rivers respond to heavy rainfall. These new river level monitors will serve two purposes. Firstly, they allow the public to view the river state at times of heavy rainfall and secondly they will allow Slow The Flow to measure and demonstrate the efficacy of the natural flood management interventions that are proposed and currently being implemented in the Upper Calder Valley. Slow the Flow Calderdale have also been awarded a grant from the Community Foundation for Calderdale to execute a youth project focusing around our river level monitoring activities. As a pilot to the project, Slow The Flow are holding a short course on river flooding and Natural Flood Management which will also cover river level monitoring techniques which we are proposing to roll out across the Upper Calder catchment. Everybody living or working in the Calder Valley can make small changes to slow the flow of stormwater in their own homes, at work, school or in public places. Many small interventions, to slow run-off, could result in a significant amount of water being temporarily stored during storm events in our urban areas. 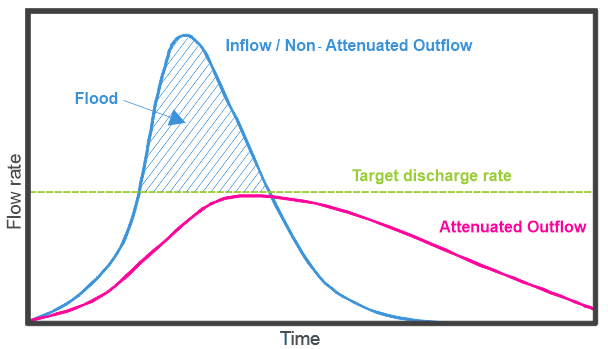 This will help to reduce peak flows (see the storm hydrograph above) which, together with catchment management and traditional flood defences, would contribute to reducing the scale and damaging effects of flood events. Sustainable Drainage Systems (SuDS) mimic the natural cycle of water management, by retaining water where it lands instead of shedding it quickly to drains and watercourses, which can lead to flooding. Lots of useful ideas and schemes can be found here either at home, work, school or in public places. As a result of global warming, it is clear that our climate is changing resulting in ever changing weather patterns from floods to drought. It is also clear that the money required to pay for hard engineered schemes will continually be stretched so it is up to us as a community to originate and develop ideas to reduce the likelihood and impact of flooding events. Slow The Flow Calderdale have been incredibly busy since our formation in 2016, and our workload shows no sign of abating. In fact, we are busier now than even on the various challenges we have set ourselves. We all remain unpaid in the management of Slow The Flow and rely continuously on the very hard work and dedication of our amazing group of volunteers who range in age from 10 to over 70. We are very lucky to have the significant support of our partner agencies and thank them for the help and assistance they provide to the people of the Calder Valley in reducing flood risk. Much of this work by them often goes unrewarded at times but if we continue to work together, we can all make a difference and reduce the likelihood of flooding throughout the UK. If you can help in any of the schemes above, please do get in touch with us. If you live in other parts of the UK and think that your community can benefit from NFM, then our website www.slowtheflow.net is a good place to start to develop your own schemes.